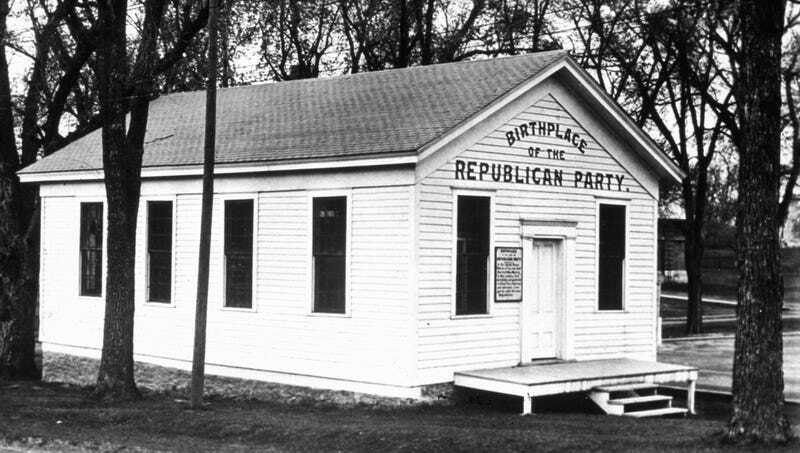 Founded in 1854, the Republican Party has been one of America’s two major political parties for most of the nation’s existence. The Onion presents a timeline of the party that currently controls all three branches of government. Current Senate Majority Leader Mitch McConnell born. President Abe Lincoln adds note at the end of the Emancipation Proclamation clarifying that his freeing the slaves means Republicans can never, ever be accused of being racist. Cartoonist Thomas Nast popularizes the party’s mascot, an elephant that hates poor people. President Benjamin Harrison presides over only four-year stretch in American history where literally nothing happened. Congress votes to censure Senator Joseph McCarthy, and the GOP learns an important lesson about not relying on fear and demagoguery to win elections. Democratic and Republican parties decide to switch platforms out of boredom. Richard Nixon becomes the only Republican president to face consequences for his actions. Republicans sweep midterms on the back of the “Contract With America,” which promises they’ll be beholden to interests of a completely different set of lobbyists than the Democrats. President George W. Bush begins successful campaign to ensure nation completely forgets about Iraq War. Another traditional Republican elected president.